For autistic children - to support and raise awareness. Each pet is personalized with a name and date of birth if desired. Please indicate whether you want the design for a boy or girl. Colors will be the same as the listing, unless you indicate another color preference. Please put the name and date of birth to be embroidered in the comment box. Bear is approximately 16" tall. You can remove the stuffing pods and machine wash the body to keep it nice and clean. This sweet bear means so much to us!!! It's even better in person! So soft and stitched beautifully. We thought it would take longer to arrive and it came so quickly! 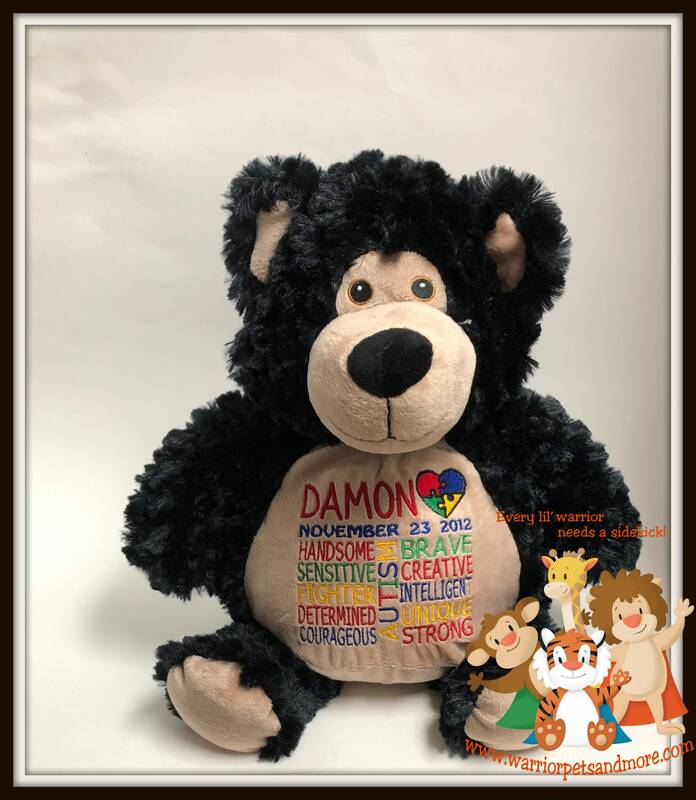 Now we will be able to give our son his bear when he starts ABA therapy next week. His routine is about to change which is hard for him but he will have this bear to snuggle with and remind him of how much he is loved every single day. Thank you so much!! !